A couple of years ago The Cardinal was working on corrections of some landmarks for Google Maps that were incorrectly labeled along Rand Road in Arlington Heights. Google had a feedback section for maps that allowed users to submit corrections. It was during that feedback session that an idea popped into mind. How about something that works like Google maps for the body? Google was immediately given that feedback as a suggestion. It turns out there were a lot of people that had that idea, and now it’s reality. 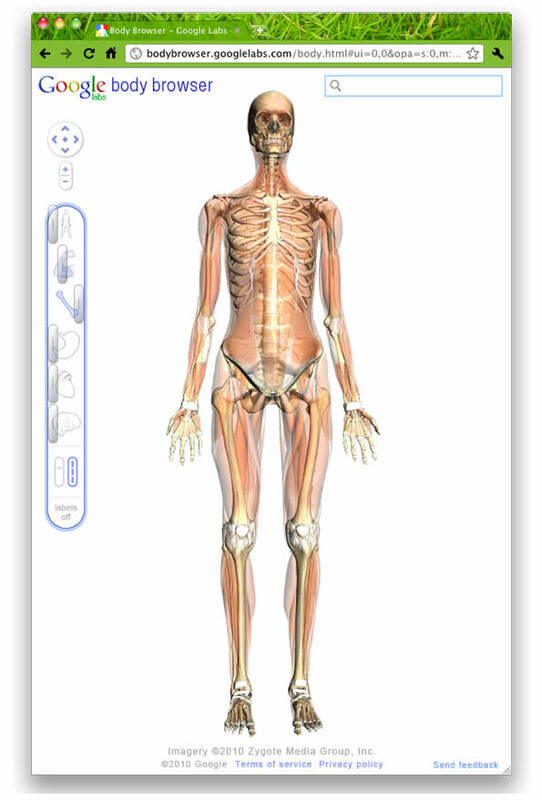 Google released Thursday in their Google Labs section a tool to provide users with a layered, 3D view of the human anatomy — Body Browser (bodybrowser.googlelabs.com). A view with the slider on 100% muscle view. A view with the slider on 100% skeleton view. 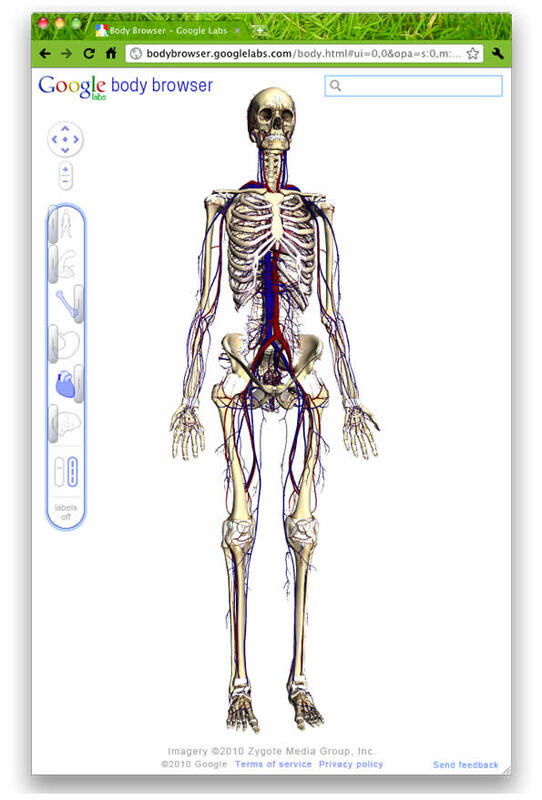 A view with the slider on 100% circulatory system view and 100% skeletal system view. 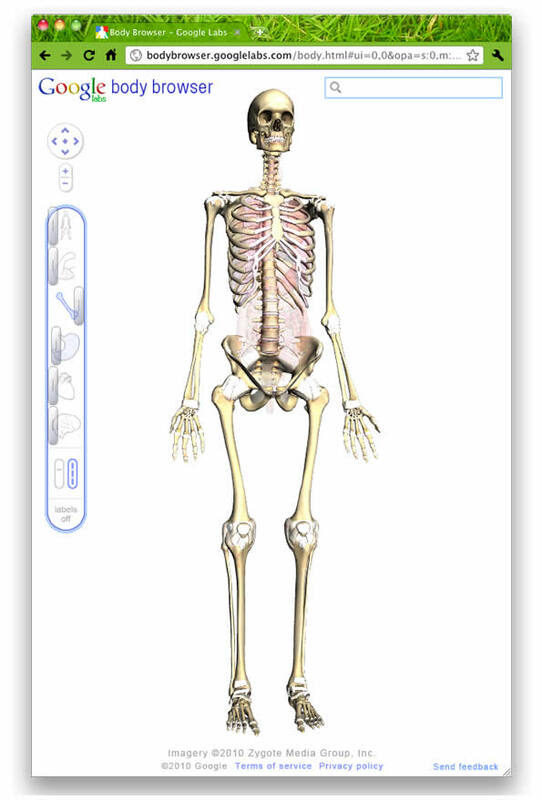 A view with the slider on 100% skeletal system view and 50% muscular system view. The Body Browser tool, which is not officially released, yet, but is available in Google Labs, works a lot like Google Maps and Street View combined. The user can rotate the entire view of the body, so that the body is seen in front view, side view, or rear view. It even allows top down views and views from the floor up. Body Browser from Google Labs requires a browser that runs the new WebGL graphics standard — to date only available on Google Chrome (beta on Mac) and the latest Firefox beta. On the left there is a sliding control scale for the (1) surface topography of the body, (2) muscles, (3) bones, (4) all organs excluding (brain, nerves, heart and blood vessels), (5) heart and blood vessels, (6) brain and nerves. Body Browser is designed to let users identify various parts of the human body by browsing, or by using a text search for bones, organs and muscles. For example type ‘supraspinatus’ muscle and the suprapinatus muscle becomes highlighted on the anatomy figure. Beneath the six systems slide controls, is a switch for unified control of system slide control or a ‘peel away’ feature that combines a peel away of the skin and dissolving process down to the nervous system and then down to nothing. In other words, with the switch you can peel away layers in aggregate or by individually controlling each system. The zoom feature allows the user to look at the whole body, or just one section at a time, such as a knee or shoulder. The Body Browser worked very smoothly on a Mac Mini using Google Chrome. It operated more smoothly than some dedicated desktop applications. After spending about an hour with Google Body Browser, only one error was noticed so far. The striations of the trapezius were drawn 90° perpendicular in the wrong direction. The fibers should be about parallel with the deltoid muscle fibers up by the neck and shoulder region, but instead they are almost perpendicular to the deltoid striations. Hopefully Google will add the embed feature that is available in Google Maps. For now, however, a link in the URL box can be shared to provide a friend or anatomy partner with the same view that a user has created. In its current version, there is not a cross-section view of different levels of transverse views. 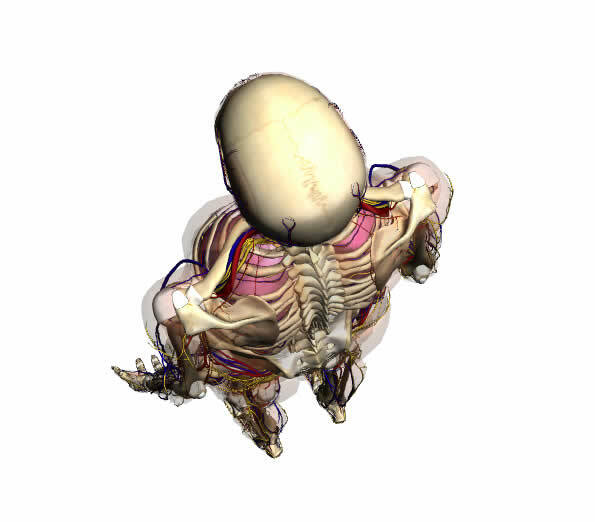 In other words the slider does not take the user to different transverse sections in a top-down view, it ‘peels away’ the aggregate body structures in 3D, just like other views. The Body Browser tool is a fantastic start for a new project. Probably, many new features will be added. Here’s a wish list, not rumored upcoming features. Perhaps users will be able to save their own personal body maps, and to place markers on the body to log injuries, pain locations, goals for the body. The markers would work like they do in Google Maps with default icons for pain, numbness, tingling, lacerations, bruises, etc. The marker bubble with HTML capability, just like Google Maps links photos and hypertext for other web locations, would link to digital files, such as x-rays, MRIs, etc. In years and decades to come there will probably be similar tools for other species, as well: dogs, cats, fish, and many other living creatures. WebGL is a context of the canvas HTML element that provides a 3D graphics API implemented in a web browser without the use of plug-ins. The specification is currently a work in progress. WebGL is managed by the non-profit Khronos Group. WebGL is implemented in the development release of most major browsers. Currently, implementations are available in Mozilla Firefox 4, Google Chrome, and Safari. The WebGL working group includes Apple, Google, Mozilla, and Opera. The tool does not work in Safari version 4.03.